Well I’ve been plodding slowing away at my port of CotAB to C#.Net code. I had been quite idle on the project about 1 month ago. In the last week I’ve been working on reducing the number of warnings and errors down. This was to try get it closer to a compliable state, and I was bored with straight translation. Tonight I spent a bit of time going back over the file archives, to get an idea of how progress has been over this phase of the development process. Using this I made an Excel graph of Lines of Assembly left to translate (or delete as the case may be), and compiler Errors and Warnings. There is still lots today once the code is all translated. 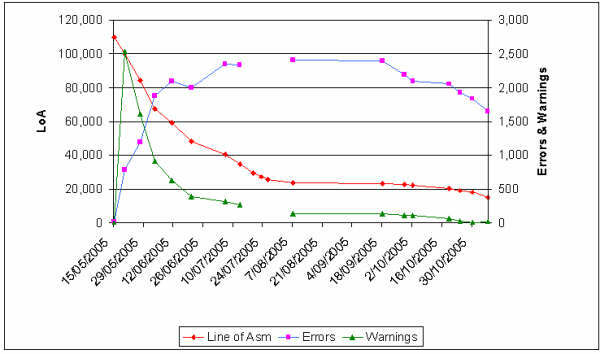 A large amount of the errors are related with variable size issues. Like . the a + 1 gets converted into a int which cannot implicitly be cast to byte. The other major error cause is the signed of variables as by default BYTE have been byte type, and WORD have been short. So there is a lot of digging through the assembly to workout how things are been used. Then later.. “There where also other blocks that could have matched if the pattern was more general like this…”. And maybe in complete dream land, after fluffing around with nested and combined if logic it could say. “I see some higher level logic here, would you like me to show the proof”. And of cause, I’d not have to pay the world for this program in any of the forms of money, my time or others time (ie wait for it).